Two momentous events of the past month cannot go unblogged, despite my being late in setting them down. One is the Dodge Poetry Festival in Newark, New Jersey this weekend – the largest poetry event in North America, the ‘Woodstock’ of poetry, poetry Mecca. Patricia Smith, Terrance Hayes and Dorriane Laux are some of the poets who brought me to America, and some of the poets I saw and heard. But before I talk about this, I want to put these writers on the same stage as another group of poets I’ve been privileged to see since arriving – the Urban Word young poets, specifically those who shared their work at the Preemptive Education Conference at the end of September. was a full weekend of workshops, performances and lectures for poets, teaching artists, school teachers, young people and academics, exploring ‘critical issues that affect today’s youth, while providing creative and practical resources to address them…using the power of spoken word poetry and hip-hop as the lens to explore language and privilege’ (UW). The event I want to celebrate most was the opening evening, entitled ‘Poetry is Pedagogy’, in which acclaimed academics from the fields of education, social justice and the arts, responded to works written and performed by young poets. For me this embodied the power of the whole conference and its reason for being. I’ve never seen this done before. What I mean is, I’ve never heard an academic scholar discuss, extol and explore the work of a young (17-21), ‘unpublished’ poet, with the attention, gravity and respect of one thinker/writer talking to (and about) another. 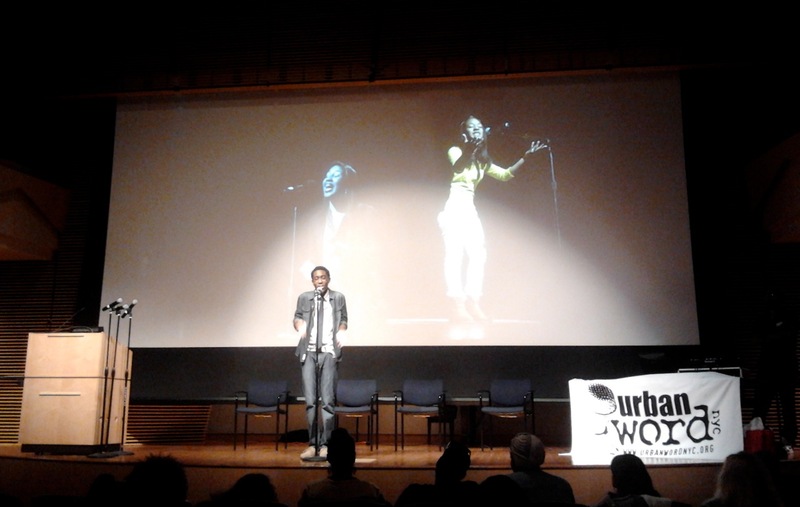 What became clear was that the poets – Sabrina Ross, Danni Green and members of the 2012 Urban Word NYC slam team – were themselves engaging in the same active, intelligent criticism of the US education system (and the social system underpinning it) that the academics – Dr. Ernest Morrell, Dr. Yolanda Sealey-Ruiz and Dr. Kersha Smith – grapple with in their own work. Sabrina Ross performed a impassioned and carefully wrought poem on the silencing of young people in classrooms; Danni Green’s beautifully crafted work spoke of her own struggle to get to university and her refusal to accept the future laid out for her by the sense of failure hanging over her community – a future personified as ‘a husband I don’t love’. The message of the evening was clear. Young poets, thinkers and activists such as these deserve the same stage and critical attention as so called ‘experienced’, published writers (the word ‘young’ is actually misleading as it suggests inexperience, in both writing and life). This is true because of the importance of what they have to say, as well as the form and language in which they say it. But the message was also that their work needs to actively inform the education system; that this level dialogue of poet-young adult-professor is essential to education. Now I come back to the other stage, and to the incredible poets I saw this weekend. What was striking (though it should really be obvious) is how many of these giants of American poetry are engaged in the same struggle as the Urban Word poets – struggle against injustice through language (in both senses), struggle with language itself. To sit in a room with Amiri Baraka and historian Clement Price as they spoke about Baraka’s experience of the 1967 Newark Uprising and the founding of the Black Arts Movement was to recognise art as a truly transformative, social force. Patricia Smith performed a sequence from Blood Dazzler, her collection of poems in the wake of Hurricane Katrina, accompanied by The New Jersey Symphony Orchestra String Quartet. Smith’s work embodies the hurricane through so many voices, including Katrina’s own, with such compassion towards the people she is imagining and reporting on, that there is no presumption in her personas. As Smith read, the vast, Prudential Hall audience included pockets of students who had been visited by the poets the previous day. The Dodge Festival was remarkable not just for calibre of poets it assembled, but for the way it put them to work, in full recognition of the role poetry needs to play in contemporary education. This entry was posted in New York Notebook and tagged Dodge Poetry Festival, Fulbright experience, Miriam Nash, Poetry and social change, Poetry in Schools, Preemptive Education Conference, Urban Word. Bookmark the permalink.